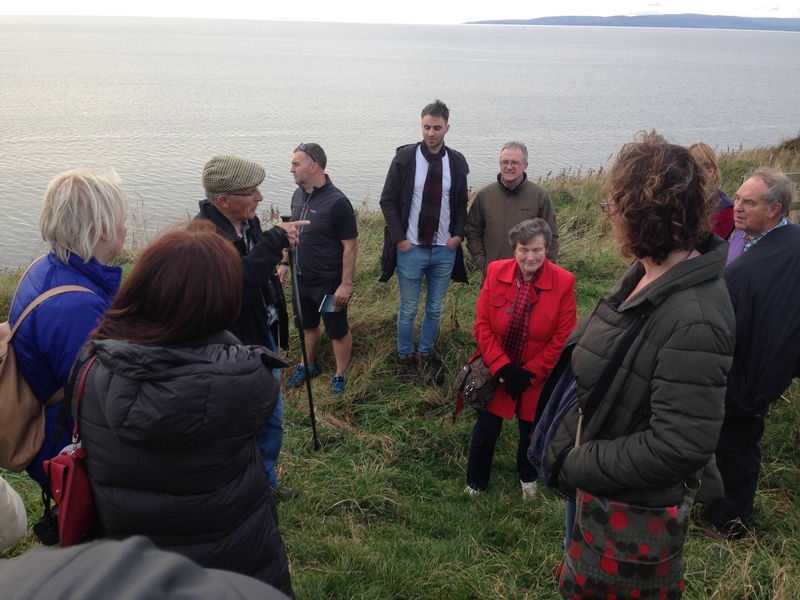 On Thursday 20 Oct 2016 – Ron and Mhairi Ireland and Jimmy Begg met a large party of Irish visitors at Troon Marina, following a visit the previous day to the West Highland Way, and a morning meeting at Saltcoats with Louise Kirk and Rachel Shipley, the NAC/SAC Access Officers. 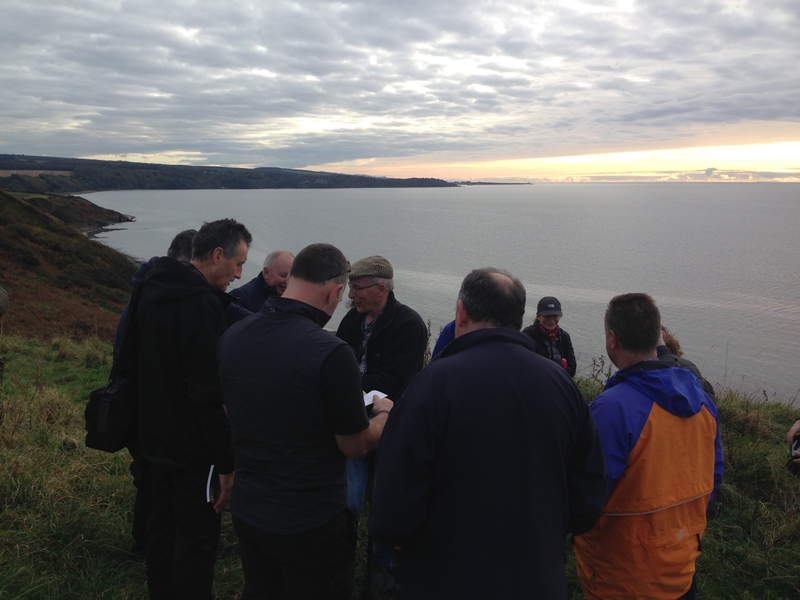 Seventeen in all, they were on a “best-practice” fact-finding trip to the ACP, Mull of Galloway Trail, and West Highland Way, gathering ideas on how to proceed with developing the infrastructure for the International Appalachian Trail Ireland, which runs from West Donegal to Larne. Ron an Mhairi acted as couriers for those on the bus, showing them the ACP urban route through Troon and Ayr, as it followed Jimmy and his carload of VIPs, including Inge Bock of Donegal, Sam Crowe of Carrickfergus Rotary, and two other guests from Derry/Strabane, down to Dunure. 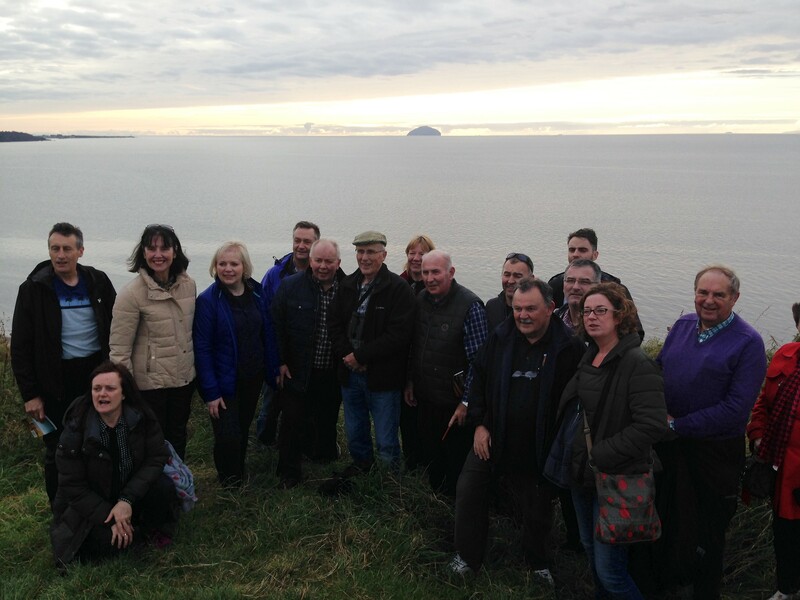 From here, the party walked the cliff-top route from Dunure to Drumshang, admiring “the bridge” and superb views of Arran, Ailsa Craig – and Ireland – before rejoining their bus to go on to Stranraer, where they were meeting Tom Stevenson for a look at the Mull of Galloway Trail on Friday morning. Although the IAT Ireland is mapped out, no real route infrastructure has yet been put in place. But agreement has been reached among the six-seven local authorities from Donegal, cross-border to Derry, Antrim Glens, and Larne to set up the route to benefit tourism. One problem to be got round is that Irish farmers are not subject to the Right of Responsible Access that exists in Scotland. Jimmy explained how important it is to establish mutual goodwill and trust with landowners and deal with problems swiftly, should they arise. Feedback on 24 Oct from Derry/Strabane District Council officers – declared it a very successful visit, with lots of questions answered. “We learnt an awful lot and have a much clearer vision for our own trail development going forward.” They thanked ACP for helping plan their trip and supplying a lot of useful information. From Inga Bock, the Rural Recreation Officer in Donegal – she and her colleague Richard Gillen “kept saying that it is so refreshing that you can walk a trail that is left natural.” – as they have to deal with so much regulation and bureaucracy from Councils.